It is a beautiful sunny afternoon in Cape Town. 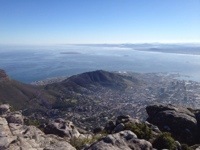 This morning I was able to visit the top of Table Mountain. The views from there, on a clear day like today, are amazing. The city stretches out beneath you to the bay. The sea shimmers. And Robben Island sits in the middle of the water, so near you feel you could reach out and touch it. It is hard to believe that it could have served for three centuries as a base for banishment, punishment and imprisonment. I am now at Ottery Boys Centre, home to 65 young men, sent to the centre by the courts to serve out sentences. There are no high walls bank vinous security and about ten of the boys, dressed in uniforms of blue polo shirts and grey trousers, lounge under a tree in the grounds, waiting for us to park our car. We are met by the centre manager. It is the aim of the institution, he explains, to help the boys find a purpose in life, so that they can re-enter society. I nod politely. I have heard this message before at other correctional institutions around the world and have always found that the reality seldom lives up to the rhetoric. Today, I find the opposite. The boys, their teachers, Award staff and I sit around a long table in the prefabricated building that is used as a meeting hall. The boys are hesitant to begin with. They are used to speaking in Afrikaans and not English. And they are not unlike any adolescents boys the world over. They prefer to grunt rather than speak in full sentences. But gradually, after I have explained that the only Afrikaans word I know is “brai”, they loosen up. They are all Award participants. They have completed their Bronze and are now beginning their Silver journey. Yes, the programme is fun. The best bit? The hike. Definitely the hike. They had to do it in the dark. They couldn’t see anyone except the person in front of them. They had to trust each other. Otherwise they’d fall over. Yah, it was hard. But it felt great when they’d finished. I ask about the Skills Section. What have they been doing? Plumbing. Woodwork. Things that will give them a job when they leave school. And then Paul stands up to demonstrate his skill, singing. His rendition of Nessun Dorma, in a rich baritone, is nothing short of beautiful. What about sport? Well, Peter has recently represented the area in a regional athletics competition. The Award is helping these young people to discover what they can do, rather than what they can’t. They’ve spent their lives so far being told in one way or another that they are worthless. It’s now time to discover the potential hidden inside them. The boys give me a quick guided tour of their accommodation. It is made as homely as possible, with the aim of instilling pride and self-worth in the young men, rather than reminding them that they are in a correctional institution. There are flowers in the dormitories. The curtains have tie-backs. The duvet covers are colourful. There’s an awful lot of smiling. When the time comes for the photo-call, there’s some good natured jostling to see who will stand next to me. Where should we take the photo? By the tree? By the garden they have been tending? No, they’d like the photo by the manager’s car, please. They aspire to owning just such a car when they become adults. And yes, they’ll be buying their cars. Not stealing them. More smiles; more grins. As we leave the centre, I can’t help thinking of Robben Island. South Africa has come a long way in the last twenty years. Previous Post Uganda – A twenty year affair.